Deciding to invest in a new applicant tracking and electronic onboarding software to your Human Resources department can be a major undertaking. It is important to take the time to define your requirements, approve a budget, and research available products. Most software implementations take place over several stages that include a demo, planning, setup, user testing, adjustments, training and going live. This can take several weeks, or even months. It’s easy to lose momentum during this period from selection to going live. Creating a plan, knowing your users’ needs, and establishing a training platform are all key elements in the success of your new applicant tracking software. Make a project plan, and try to stick to the deliverables. It’s easy to get off track when you’re busy. Carve out time on your schedule with target dates for setting up, testing, training and going live. Know who will be involved during each step. A project manager can help keep things on schedule when things get busy. Someone on your team should be the champion on your team, mentoring others and providing support, assistance and advice. Someone who’s willing to be the Super User who knows as much as possible about the software and how it works. Training is a key component of getting any software purchase up and running. Training should be a continuous ongoing process. Some people are resistant to change, especially if comfortable with a previous process or software. It can be a struggle to get them onboard. This comes back to providing training to make sure they are comfortable with their tasks in the software, and that they can see the benefits of using it. 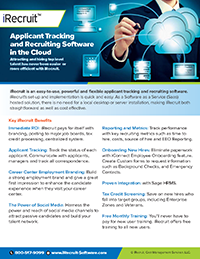 This entry was posted in Blog, iRecruit Blog and tagged Applicant Tracking Software Checklist, Applicant Tracking Software Comparison, human resources software, Keys to Successful Adoption of a New Applicant Tracking System. Bookmark the permalink.